Follow the footsteps of John Wayne and become a real gunslinger! There are many different possibilities to compete with the other players. Visit the city and explore the desert... It is not easy to survive as a rugged cowboy in the Wild West. In Rangersland, you have the chance to prove that you match up to the rough job. 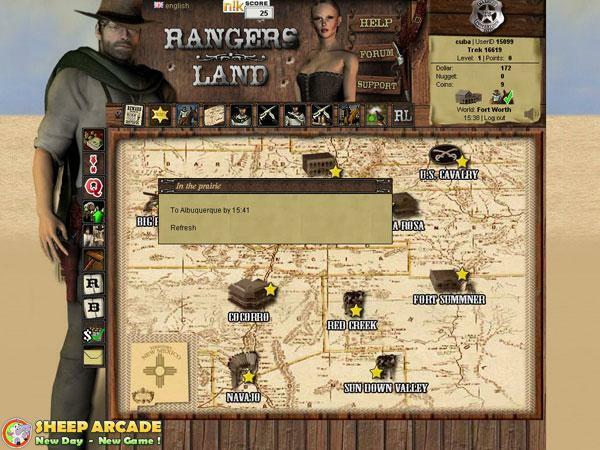 At the beginning, the game takes you to Santa Fe, New Mexico. 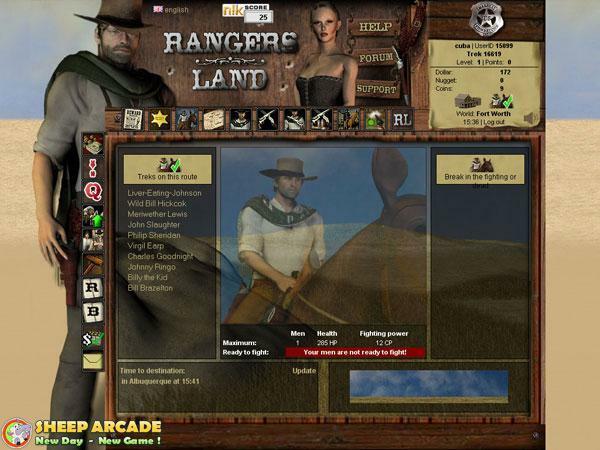 In the game Rangersland, citys offer the opportunity to be left in peace, trade without being attacked, purchase equipment and start new quests. You can even go to the saloon without having to worry about attackers. Furthermore, in the city you have the opportunity to manage your money and gold at the bank. The situation is very different in the prairie. It’s not safe there at all. To get from one city to another you have no choice but to cross the sandy no-man’s-land as a lone cowboy. In the prairie you can be attacked by other players and robbed of your stuff. Therefore, it is a good idea to travel together with other well-trained men. A membership in an alliance may also offer protection against aggressive predators - in Rangersland alliances are called 'gangs'. In fellowship with other players, your chances are better not to lose your belongings to hostile cowboys.